‘Zuchini Slice?’ I hear you say. Yes, this is a very popular and well loved Australian snack or side dish made with Zuchini, or Courgette as we would call it. I first tried this snack when I was working in Oz. I was working in a hair salon at the time and we were very busy every Saturday, too busy usually to take lunch, so one of my colleagues brought some in to work for us to snack on throughout the day. It was kindly supplied to us by her Mam, and greatly received. Such a simple snack but it was delicious and packed with flavour. 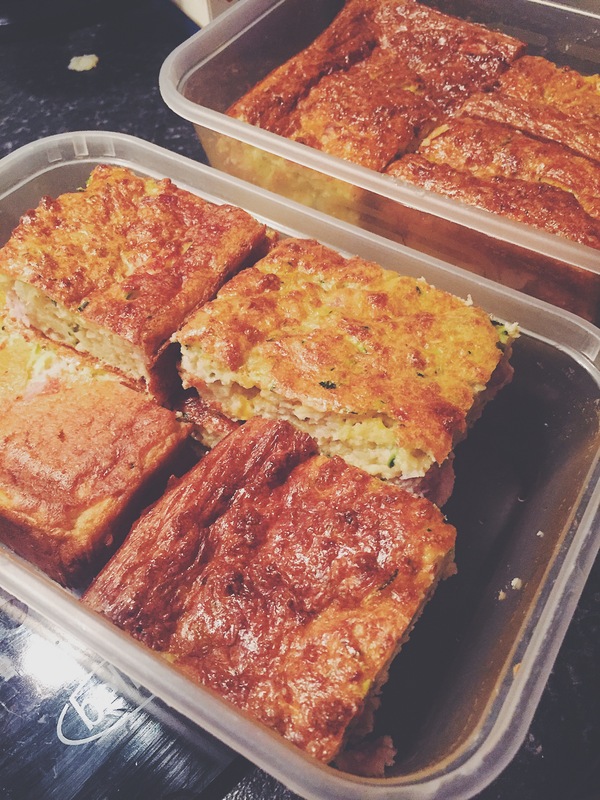 While living in Oz I found a recipe online and made the Zuchini Slice a number of times because I just loved it, but since coming home to Ireland and joining Slimming World, I have stayed away from it as usually it would contain a lot of SYNS (or calories for those of you not in the slimming world loop). But last week I had a brainwave, I decided to try a healthier, lower fat version! This brainwave came after I made an omelette using Quark (a type of soft cheese), and seeing a fellow Slimming Worlder making savoury baked oats. I figured combining the basic recipes for both would make a very similar texture to the Zuchini Slice I loved from my time in Australia… And I was right, it did haha. So here is the recipe I put together! Blend your oats in a blender until they are fine (I use my Nutribullet). Mix your oats, cheddar, onion and courgette with your salt, pepper and baking powder in a large bowl until it looks evenly combined. Next, Crack all of your eggs into a separate bowl or jug and whisk together (you can use a fork here if you don’t have a whisk) until they are all mixed together evenly. Chop up Bacon Medallions into small cubes. Combine all ingredients in the large bowl and mix until you have a batter like consistency and all the ingredients look evenly dispersed. Transfer into a shallow rectangular baking dish, i used a disposable one which measured 30cm x 20cm x 3.5cm. Cook for 30-40 mins. Check the colouring after 30 mins, it should be lightly golden on top and springy in the middle. If you are a Slimming World member, this recipe contains 2 HexB’s for the oats and 1 HexA for the cheese, or it is 20 syns in total so you can work it into your plan however way you want! I cut mine up into 20 1-syn slices and snacked on them throughout the week, but you could use your healthy extras and have a chunk for lunch or dinner with a nice salad! This recipe works out around 400 calories for anyone not doing Slimming World. This recipe can be eaten warm when cooked and can be reheated but it is nicest (in my opinion) when cold. This means it is the perfect savoury snack to keep in the fridge! Well I hope you liked this post and I’d love to hear what you think of the recipe, so if you try it out be sure to let me know how you got on! You can snap me on Snapchat (jenok9) or tag me on Instagram (@jenok).